I never saw Garbage in concert back when they were super big in the 90s. Despite the fact that in my fantasy life I had that kind of 90s riot grrl rock persona, in reality I was about as far away from that as you could get. Shy, timid, conformist are better ways to describe what I was my senior year of high school when Garbage’s first album came out. If they were even playing anywhere at that point that I could have gotten into I would have been terrified about going to a club at that age. By the time they would have been playing the larger venues I was off in college and just not going to many concerts like that because it was a trek to get any place they might have been playing from where I was. Thus I pretty much missed them their first go round. For whatever reason every once in awhile I like to go down a rabbit hole of watching Garbage concert footage on YouTube because Shirley Manson is fun to watch. Every time I do it I would look to see if they were going to be touring at all and until recently the answer was always no. About a month or so ago I did this and discovered that they were in fact touring for the 20th anniversary of their beginning and that they were playing two nights at the 9:30 Club. Unfortunately at that point the concert was only a few weeks ago and probably long ago sold out. I seriously don’t know how I missed this because I follow the 9:30 Club on Twitter and get their weekly concert announcement email. If I miss out on concerts tickets when they’re on sale I usually just consider it not meant to be. I hate paying greedy ticket resellers two or three times face value to go to a show, so I pretty much never do. In this instance though I decided I really wanted to go and set myself a threshold of how much I was willing to pay for a ticket and started stalking Stubhub and Craigslist for tickets. Unfortunately this was made a little more complicated by the fact that they only sold paper tickets for this show and no digital ones presumably to cut down on counterfeit tickets for what they knew would be sold out shows. Thus I would see tickets in my price range but being sold by people who wanted someone to meet them in DC or Northern Virginia to pick them up. Luckily good karma was on my side. Whenever I can’t use concert tickets that I bought for whatever reason and I resell them, I never, ever sell them for more than face value even if I could get much more for them. One night I was on Craigslist looking and saw someone post two tickets for face value in Columbia, which is well within range for me to get to without too much hassle. We arranged to meet outside a Dunkin’ Donuts the next morning and I got my tickets. So thank you random guy on Craigslist for not being a jerk and selling your tickets at face value. My husband is having to commute to DC for work these days, so I decided that since he was already going to be down there that he should use the second ticket. Plus of all the bands I ever dragged him to see Garbage is probably the most up his alley. Because he’s an awesome guy he also drove down to DC the morning of instead of taking the train so that I could take the train down in the afternoon instead of driving down in rush hour in the rain. There were many things at this concert that emphasized that 20 years is a long time and all of us who gravitated too this album during our high school years are now old. 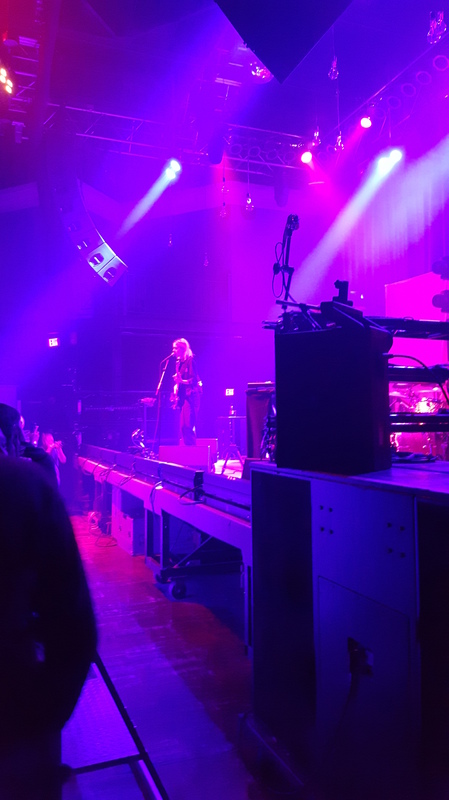 I knew that the audience was going to be older than the typical concerts I go to where I feel like a grandmother compared to all the teens and young twentysomethings that tend to be there. As expected this concert was decidedly full of people my age and older. The people in front of us in line going into the venue brought their teenage daughter with them (she wasn’t even born when the first album was released!) and the father was explaining what bootleg tapes were to her. The thing that really made me feel old though was hearing, if the 9:30 Club staff member is to be believed, that the filming that was going on during the concert is for something that’s going to air on PBS. PBS! The Garbage fan base has now also become the PBS fan base. Who would have ever seen that coming back in 1995? The opening act was Torres. I can’t actually think of a more perfect opening act for Garbage. I had heard a few songs of hers here and there, but hadn’t really ever sat down and listened to her much before. She has that same growly, punk rock voice that Shirley Manson has when she sings. It’s not probably something that I’ll seek out again, but I thought the set was a good complement to Garbage. Garbage started out the concert by putting a large drop cloth in front of the stage and then playing a compilation of television footage from when they hit it big on it. They then also sang their first song hidden completely behind the cloth such that (most) of the audience was only seeing their shadows. 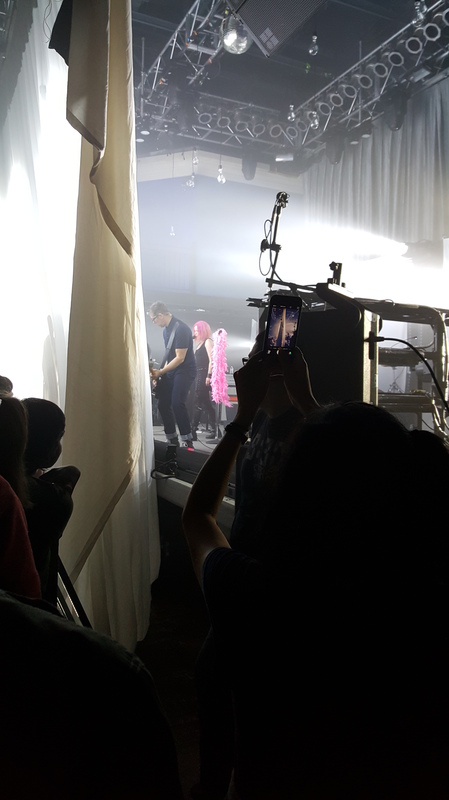 I say most because I was off on the side of the stage and could see the band behind the curtain. It was also the perfect place for me because I could actually see most of the stage from where I was. In a sold out standing room only show my short self was resigned to pretty much not seeing anything. 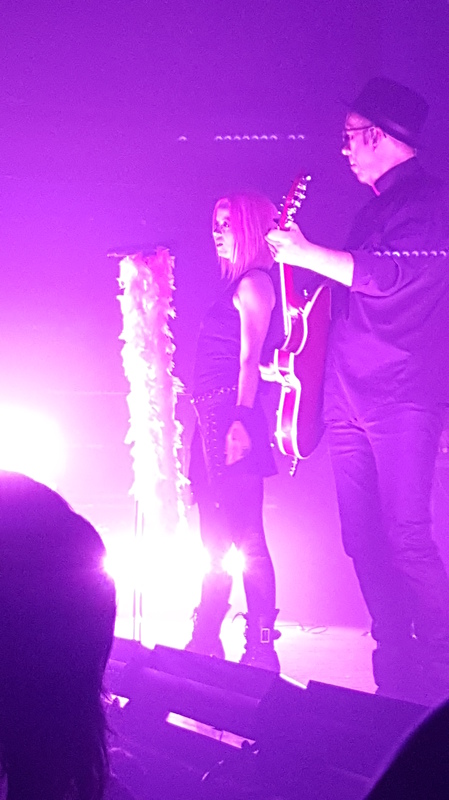 Since one of the reasons I wanted to go was to see Shirley Manson perform, the fact that I could perfectly see the part of the stage she was on the entire time made me really happy. I should also mention that one of the reasons I really wanted to go to this concert is that they were only playing songs from 1995 and 1996, which pretty much meant the self-titled first album and any B-sides that were put out during that time. If was going to see Garbage in concert that’s pretty much what I wanted to hear, so I didn’t want to miss out on the chance to get exactly what I wanted. And as advertised that’s what they did. They may be 20 years older, but they are still 100% great performers. Shirley Manson might not be quite as energetic on stage as she once was, but I’d say she’s still a good 90%. I really love her so much. She scares me a little when she’s singing, but it’s kind of funny because when she’s not singing she seems like a completely nice person. She had lots of great stories to tell and really seemed very appreciative of the audience and what the album meant to them. I also quite enjoy her laugh. Then she starts singing and seems like the most intimidating person. I guess that’s the point of the music though. It was a fantastic show, and everything I wanted it to be. I’m so glad that all the pieces fell perfectly into place for me to be able to go. It was meant to be.